JustGiving, the world’s no. 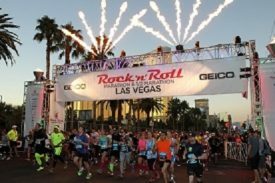 1 platform for giving announced a 3 year partnership with Competitor Group Inc.’s (CGI) Rock ‘n’ Roll Marathon Series, the largest running series in the world. The online giving platform has 16 years’ experience and 20 million users in 164 countries around the world. In that time, they have raised $4.2 billion for thousands of charities and crowdfunding causes. Launching their presence in the US, JustGiving will bring their social fundraising expertise to Rock ‘n’ Roll Marathon Series’ 575,000 participants – giving them the chance to raise more for the causes they care about. Combine this with the recent acquisition of Just Give and its 1 million users and 1000 companies, JustGiving with the Rock ‘n’ Roll Marathon Series is poised to revolutionize fundraising in the USA. “We are excited to announce JustGiving’s new partnership with CGI and the Rock ‘n’ Roll Marathon Series. Bringing together the biggest running series in the world with the no.1 global fundraising platform will mean more money will reach the causes runners care about. Our plans to expand in the US look at connecting fundraising and the running industry by delivering a unique value proposition that will benefit all US events, charities and industry leaders as we work closely together to make the world a better place. The new partnership comes as the Rock ‘n’ Roll Marathon series celebrates 20 years of running. Delivering events that combine people who love running with live music and huge cheering teams to create a block-party feel. JustGiving will be there to help runners capitalize on this excitement. At the conference, the Just Giving team presented the brand new ‘Match my Miles’ program. We know, on average, 14% of runners chose to make a donation to charity when they register for an event. We know that millions of participants who don’t raise money still want to make their event count. Match My Miles is our new, fun and social fundraising option that gives them a simple, light-touch way of fundraising – enabling runners to make every mile count. Over the coming months, CGI and JustGiving will be making further exciting announcements about how the brands work together and the events that will reshape how people participate and fundraise in the United States.